Having my Orange Pi One now for two weeks. I've compiled a new kernel with the great compile tool of Armbian. It seems that the Ethernet device or driver does not understand AppleTalk. Although Ethernet works... well IP does. If I use a USB Network device (as eth1 with dm9601 module) I have no problem, but the on board network card refuses to work with the AppleTalk software Netatalk. It start, but the OrangePi dioesn't see other AppleTalk devices. With the USB network card, it works fine. It is a pity, because the Orange Pi One is really the cheapest AppleTalk router in the world you could have! Anyone knows what I should try to get it working? Is there an other driver I could use? Is this network device on the Orange Pi so special? This is how it looking on a working device (NTC C.H.I.P with USB Network). Normal echo and replies. I see only truncated packages..... could it be that the driver we now use throws away parts of atalk packages? I tried 10Mb/s and 100Mb/s. That you can see bit also with the 100Mb/s still the same problem. TCP/IP is working GREAT. Not AppleTalk. Well, if it doesn't work with 100 Mbits/sec full-duplex then maybe it's really the driver's fault (written by Allwinner employees that might not even know that other protocol families than TCP/IP exist). I won't look into any of the 3.4 kernel/driver stuff any more since mainlining efforts are still progressing nicely. Ok. That is good news. Can if find some instructions to bake an image with this git repository? I'm not familiar yet how to do this with all the patches. So you might give it a try with the modifications above but be prepared that this is alpha quality. Please report back! Thanks man! This is really very kind of you! Will try this evening when the family is a sleep. Now of for shopping and family matters. OK. This version works perfect!!! Now also mii-tool give normal information. Netatalk 2.2.5 is now also running fine. Just out of the box! Put the network card in promisc mode for better exchange appletalk protocol. And YES! 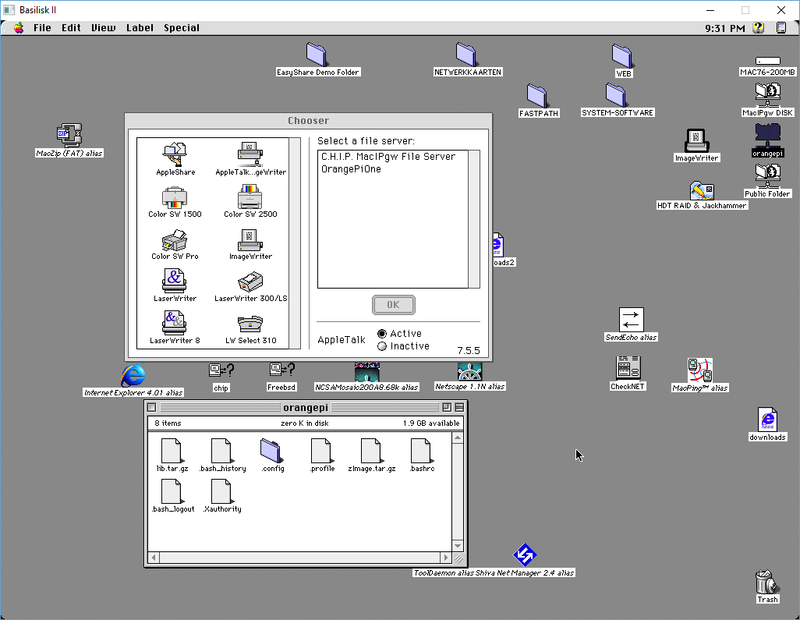 I see all my appletalk devices! Your kernel must be configured with the CONFIG_IPDDP option disabled completely. It is not sufficient to compile it as a module -- in order to support the module, the kernel is modified to intercept all MacIP traffic, so userspace applications such as macipgw cannot handle it. Found : No HDMI character screen, but SSH works via the standard Ethernet adapter. Also TvHeadEnd SAT>IP is working using port 9983. - CPU remark in dmesg, see below, is that perhaps the reason? Will look into that tomorrow in more detail. Great progress, cant wait for a final release ! [ 5.397561] systemd: Started Journal Service. Have you checked output from '/sbin/ifconfig'? The issue is known but unresolved and you kill networking pretty reliable by doing a dual iperf test (using -d switch). But for normal usage it's already pretty stable. There is zero support for cpufreq/dvfs/thermal stuff in mainline kernel for H3 now! AFAIK the H3 is clocked with 1008MHz by u-boot and remains at this setting with mainline kernel. No throttling will occur and you can easily burn the H3 using cpuburn-a7 ATM. Please keep that in mind that there's no protection currently so in case you run heavy workloads unattended you would to either limit maximum cpufreq in u-boot (816 MHz seems somewhat safe) or disable CPU cores in case CPU utilisation increases to protect the SoC! Understood tkaiser, it is only EUR 12 that gets fried and I am willing to take that risk. Don't worry. No production plans yet. I was just very curious to see if DVB and SAT>IP worked on OPiO and it does, so I wanted to give you that feedback. I just plan to use Orange Pi One to replace RPi2 so they can be used in other projects as they have more memory and there is more available for RPi2, so that has to wait a bit more then. But no problem in keeping connected with ssh. Compiled a new kernel and modules. Now only appletalk is active. No ddp. I hope now the macipgw will work. Keep you posted! It's reported to work already quite well on Orange Pi One (primitive GPIO regulator) but some troubles are reported with the other Oranges using the SY8106A voltage regulator accessible through I2C. Orange Pi One is now working as a MacIPgw, a Linux MacIP gateway. It is able to encapsulate IP in AppleTalk. 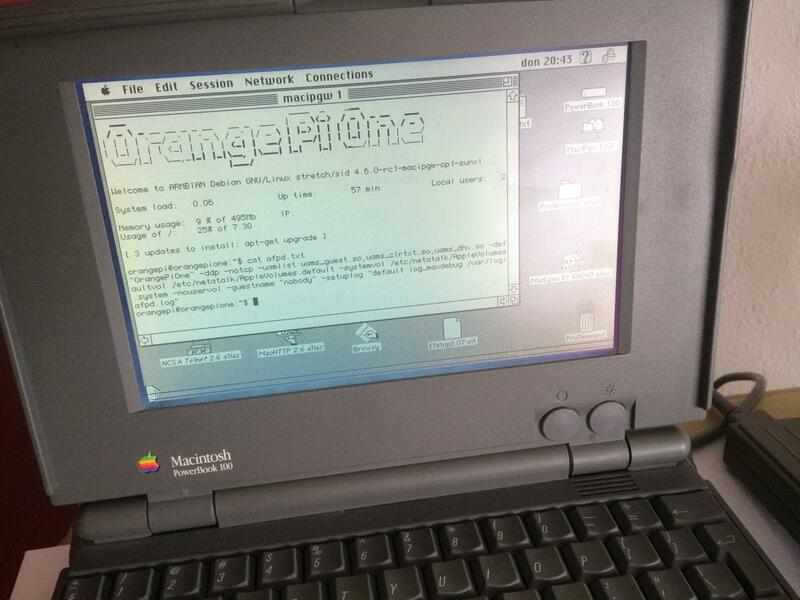 I'm now able to connect all my old Macintosh computers to the Internet with the help of one Orange Pi One. Unbelievable....... A $9,95 computer with full blown Linux OS.... Armbian!!! Thanks everybody for helping me to get this far so quickly! Look at the picture below. 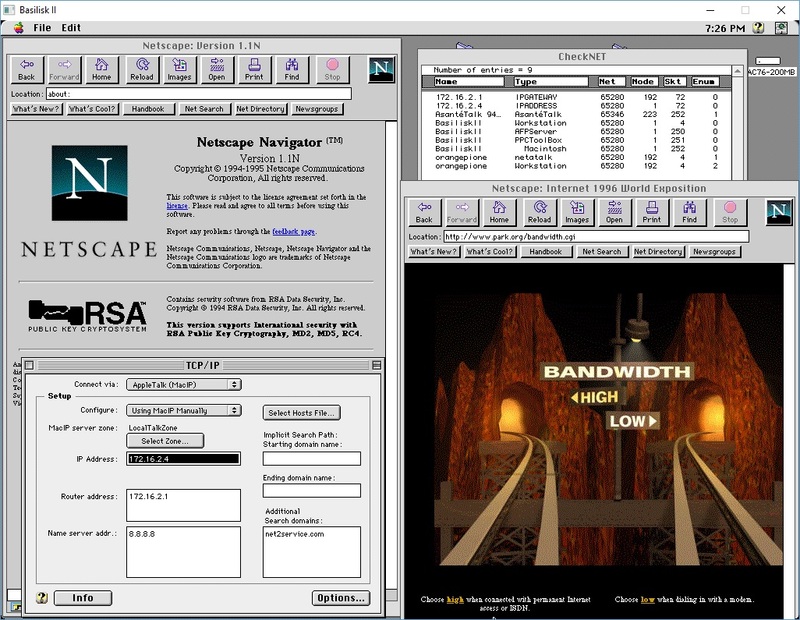 I'm surfing the Internet with Netscape 1.1 (1994/1995). To show I'm not cheating I show the TCP/IP control panel. Ok, good to see progress there also. Also added AFPD file sharing over DDP now. Working great...and fast!!! I have done it all on a $9,95 small PC. Really great!!! I will share a SD image on my web site www.macip.net. "OrangePiOne" -ddp -notcp -uamlist uams_guest.so,uams_clrtxt.so,uams_dhx.so -defaultvol /etc/netatalk/AppleVolumes.default -systemvol /etc/netatalk/AppleVolumes.system -nouservol -guestname "nobody" -setuplog "default log_maxdebug /var/log/afpd.log"
So no TCP afp possible. The speed is acceptable. I clocked a transfer of a 7 MB file in about 2 minutes. With my PowerBook 100 with its 40 MB harddisk perfectly workable. With TCP over AppleTalk it is different. That is not fast but perfectly acceptable. If you want to browse the Internet with Netacape 1.1 not many sites are available. But some telneting is perfect. See some pictures of my setup. I use NSCA Telnet to login my Orange Pi One. Well, I was talking about something different (AFP over TCP instead of AppleTalk -- Apple implemented a silent switch from AppleTalk to TCP/IP in the background if possible). Your pictures remind me of the situation 20 years ago. I complained to my boss back then that my 'workstation' (PowerMac 9500) was too slow. He bought then an additional 256MB RAM (for ~12500â‚¬), we used a Sun SparcStation 20 as server running EtherShare on it with a quad port Fast Ethernet card to speed up networking and data was stored on 3 RAIDs with 20GB each being loud and hot as hell. Great story about your work with the PowerMac and Sun SparcStations. The world has really changed! So yes also for this one. An Orange Pi One is better and cheaper! Time to update my MacIPpi project! It is made better over the time and is in use now by old Macintosh users. See this excellent post in the Swedish Dator Museum (Computer Museum) about the actual use. One bad thing about the MacIPpi is that it is still running on kernel 4.6.0 with many RX errors. Iâ€™m afraid that eth0 is working fineâ€¦.no more RX errorsâ€¦but NO APPLETALK! And yes..I compiled appletalk as a module and installed Netatalk. Is this driver for the Ethernet card now capable of running appletalk or not? I have again the same errors as you see in this same posting. The OrangePi is also not visible for other Macintosh.